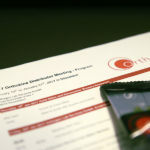 With the aid of the standardized WOMAC* questionnaire (for the evaluation of pain, mobility and physical state of the patient), clinical studies have shown that patients with osteoarthritis of the knee can make an improvement in all three criteria with Orthokine® therapy. 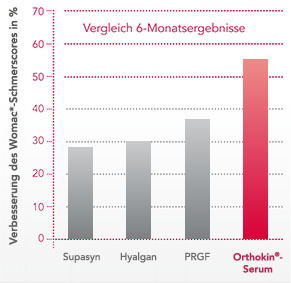 The efficacy of Orthokine® serum was examined in a prospective, controlled comparative trial comprising 376 patients with knee osteoarthritis, comparing it to placebo and hyaluronic acid. 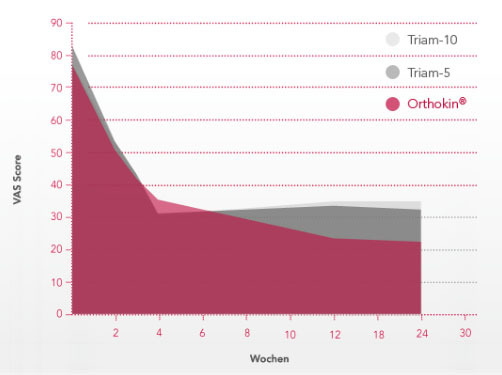 Pain relief under Orthokine® therapy was above 50 % and thus numerically higher on the Womac pain score in indirect comparison of the available studies with other intra-articular treatments such as steroids, hyaluronic acid or PRGF1, 2, 3, 4. 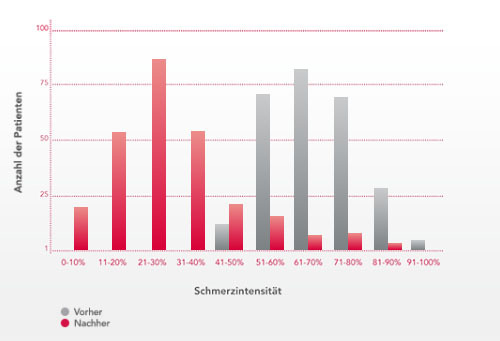 No direct comparative study demonstrating significantly superior pain reduction is available yet. WOMAC: Western Ontario and McMaster Bellamy N et al, J Rheumatol. 1988 Dec;15(12):1833-40. Validation study of WOMAC: a health status instrument for measuring clinically important patient relevant outcomes to antirheumatic drug therapy in patients with osteoarthritis of the hip or knee. Baltzer, et al., Autologous conditioned serum (Orthokine®) is an effective treatment for knee osteoarthritis. Osteoarthritis and Cartilage 2009, 17, 152-160. Sanchez, et al., A Randomized Clinical Trial Evaluating Plasma Rich in Growth Factors (PRGF-Endoret) Versus Hyaluronic Acid in the Short-Term Treatment of Symptomatic Knee Osteoarthritis. Arthroscopy: The Journal of Arthroscopic and Related Surgery 2012, Vol 28, No 8 (August), pp 1070-1078. Huang et al., Intra-articular injections of sodium hyaluronate (Hyalgan) in Osteo- arthritis of the knee. A randomized, controlled, double-blind, multicenter trail in the asian population. BMC, Musculoskeletal Disorders 2011, 12:221. Petrella et al., Effects of Hyaluronate Sodium on Pain and Physical Functioning in Osteoarthritis of the Knee. A Randomized, Double-blind, Placebo-Controlled Clinical Trail. Arch Intern Med 2002;162: 292-298. 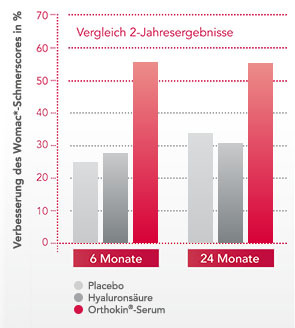 Two years after the Orthokine® therapy, patients with knee osteoarthritis showed significantly better results in terms of pain, mobility and physical status (Womac score) compared to the other treatment arms (placebo and hyaluronic acid). Degenerative changes to the spine, especially lumbar spinal stenosis, facet syndrome, and radiculitis, are common conditions which can, in some cases, cause significant limitations to a patient’s quality of life. 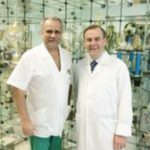 Clinical studies have shown that local Orthokine® therapy provides a good alternative to local steroid therapies for the treatment of back pain. in the long term superior pain alleviation compared to local steroid therapy (p < 0.001).